Easy to use manually and is available with various types of high security locking. Roller doors fit neatly into the front of your garage, leaving plenty of space. Sectional doors run on tracks into the garage. Hinged doors come as two doors hinging on the frame, opening in the middle. Almost every garage door can be electrically operated. 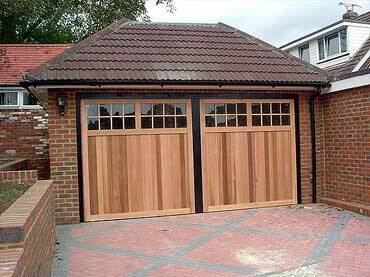 Bespoke Garage Doors available, give us a call today to find out more. Almost every garage door can be electrically operated. In most cases we can fit an electric operator to your existing door, providing it works well as a manual door. Some doors require conversion kits to work electrically, please contact us for details. Each electric operator is used via a radio key fob to enable easy remote access. A push button can also be wired to a back door in your garage. All new doors can be supplied with electric operators.